Make Your Kids' Summer Rock! We are just on the cusp of breaking through this winter's DEEP freeze andsummer is on its way (we promise!). Have you given any thought to how you are going to keep those busy minds and active bodies occupied when schools let out? We've made our favorite picks for summer camps and are sharing them with you! Visit our camps page for a full list but first look at some of these awesome programs local businesses are offering! 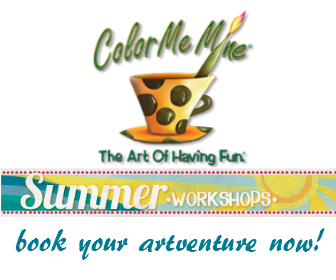 Color Me Mine "Adventures in Art"
No sunscreen required! If dirt and grime are not your child's cup of tea Color Me Mine has 8 full weeks of AWESOME themed art camps for children (6 and up). Their camps feature weekly themes see their full list of themes here. 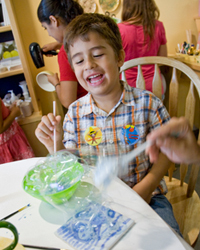 Children can stay a full day or or for just the morning or afternoon, the the unique flexibility of these workshops means you can really pick and choose the sessions you child wants to participate in and easily have them participate in specific weeks that interest them. Register for 3 or more weeks are recieve 10% off! Stop in during one of these times to learn more about their newly re-vamped programs or call (610) 791-2228 to register! The Wildlands Conservancy offers the BEST outdoor camp programs for kids. New this year is Fairy Camp, Lizards & Wizards and Biomimicry (grades 6+). Plus, their highly sought-after Water Camps, more Nature & Art and Child Vs. Wild! Children as young as 2 years old can sign up for programs with Wildlands! Programs are perfect for kids even through their teens. Their friendly and well-trained staff is second to none, has child abuse clearances and is certified in First Aid, CPR and AED. Where else can you go tubing in the Little Lehigh Creek??!? This feature is for certain a Wildlands exclusive! Wildlands also offers live educational animals – from their beloved skunk Smudge to birds of prey, plus 77.5 acres of open space for investigating.Every week is different, structured for experiential learning and geared for FUN! Plus they offer extended camp hours that are great for working parents, which means parents won't likely need additional child care before or after camp hours. Save 10% when you register before May 3! Click here to register now! Insider tips! The Wildlands Conservancy offers campers to immerse themslves in nature by spending their entire day outdoors! Campers in grades 6+ participate in a full-day Lehigh River biking and canoeing trip on select weeks! Where the Wild Eggs Are! , Saturday, April 12 from 1-4 p.m. Fee: $10. Chance to “Crack Open” a free week of summer camp and on-site registration. Earth Day Festival, Saturday, April 26 from noon to 3 p.m Free program. Summer camp registration on site. Summer Camp Open House, Saturday, May 3 from 1-4p.m. Free program. Summer camp registration on site. Visit www.wildlandspa.org to learn more and register for these events! School of Rock Camps Rock! 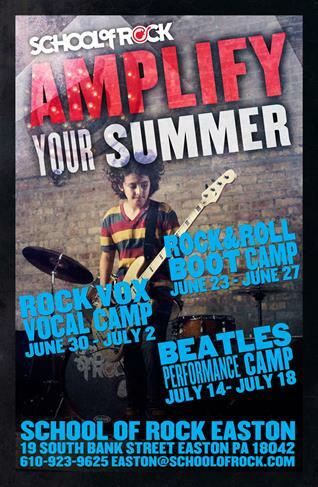 School of Rock is hosting 3 awesome rockin' musical camps for kids this summer. The School of Rock is a great music and social community for kids, where they can learn music is a safe and fun environment from some of the best musicians in the area. Children ages 9 and up are invited to register for these unique performance camps. School of Rock is at it's core a performance-based music program. Kids immediately walk into this School with something in common; a love of music and a desire to play with others. Their music staff is background checked annually and work for themthroughout the year - they don't hire seasonal employees to staff our camps, so the instructors are people they are familiar with and trust, so you can feel comfortable leaving them with them for the day. Their Easton facility is fully equipped for rockin'. Guitarists and bassists should bring their instruments, drummers should bring sticks, but they have pretty much everything else ready! If students want to, they can sign up for a couple of refresher lessons the week before the camp, so they are ready to go. Register online, spaces are filling quickly! Geocaching, Spa camp, Drama camp... these aren't your mother's girls scout camps! 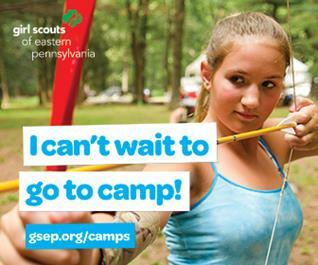 The Girl Scouts of Eastern PA are proud to be offering a full menu of camps to fit every girl's unique interests and talents. Camp Mosey Wood: Camp Mosey Wood is located in the Pocono Mountains on 425 acres and features a beautiful lake. In addition to their chosen theme, all girls experience traditional camp activities including swimming and boating on a daily basis (weather permitting). Other activities include arts and crafts, cookouts, campfires, hikes, nature, science, singing, archery, climbing wall, teambuilding activities, and wishing candles. See details on their website about family camp too! For more details on programs and special interest camps click here. Camp Laughing Waters: Enjoy 460 acres of rolling meadows, wide open spaces, a large swimming pool with lights, an athletic field, hiking trails, archery (4th grade and above) and horseback riding. In addition to their chosen program theme, all campers will participate in traditional camp activities (weather permitting) which may include swimming, arts and crafts, cookouts, campfires, hikes, nature activities, singing, and games. View their full brochure of dates, times and activities here. Camp Wood Haven: Located in Schuykill County, Camp Wood Haven has 200 beautiful acres of forests, meadows, and protected wetlands. Choose from a great selection of leadership, horse, animal, and trip programs with fun themes to make this your best summer ever. All girls enjoy swimming and age-appropriate activities like archery, low ropes, climbing wall, teambuilding, arts and crafts, journey activities, and more. Girls in grades 6-12 design their own activities in the "Choose Your Own Adventure" program. Campers may live in a tent, Adirondack shelter, or a treehouse!. View their full brochure of dates, times and activities here. Camp Mountain House: Mountain House is a wooded sanctuary located in Lehigh County minutes away from Allentown. This popular day camp has two large cabins, a picnic pavilion, a nature trail and new this year, an outdoor stage for performances. In addition to their chosen theme week, all girls experience arts and crafts, archery (4th grade and above), teambuilding activities and daily swimming offsite. Extended care options are avilable for working parents View their full list of special interest camps and programs here.